British Guiana: 1850-51, 4 cents lemon-yellow, cut square used on entire. bl.uk > Online Gallery Home	> Online exhibitions	> Philatelic rarities	> British Guiana: 1850-51, 4 cents lemon-yellow, cut square used on entire. This was one of the first issue of postage stamps made for British Guiana, now Guyana. They were printed from newspaper type in Georgetown, the capital, in the office of the Royal Gazette. Being a “primitive” production they were initialled by postal officials before issue as a security measure. 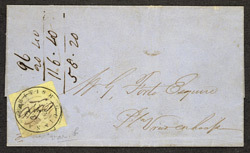 Scissors rather than perforations were used to separate copies and this is one of two letters known with this stamp affixed and cut square rather than cut round.